We are well into autumn, yet our sky at nightfall looks much as it did two months ago. The Summer Triangle (Vega, Deneb and Altair) stands high near the meridian and we still have Saturn very low down in the south-west. Shining at magnitude 0.6, and below the young Moon on the 16th, it is tracking eastwards from Libra into Scorpius but we are likely to lose it to the evening twilight later in October. The hour by hour westwards progress of the stars in the south carries the Triangle into the west and Pegasus to the meridian by our star map times. Taurus in the east and Gemini, just rising, herald the coming of our glorious winter constellations whose leader, Orion, rises another two hours later and is resplendent in the southern sky before dawn. The eastern morning sky also boasts a trio, soon to be a quartet, of planets, including Venus and Jupiter which enjoy a spectacular conjunction on the 26th. The southern quarter of our sky at our map times is relatively underwhelming. The Square of Pegasus is large, empty and far from striking though one obvious adjoining constellation is Andromeda which extends eastwards, to the left, from the Square’s top-left corner. Indeed, that star, Alpheratz, is now assigned to Andromeda after years with a bigamous classification as both Alpha Andromedae and Delta Pegasi. Andromeda’s famous galaxy, M31, lies 2.5 million light years away yet is visible as an oval smudge of light to the unaided eye, and is easy to spot using binoculars. Stand by for its collision with our own Milky Way galaxy in another four billion years or so. Pisces sprawls to the south and east of the Square but is so dim that I often omit it from our chart. The planet Uranus reaches opposition in Pisces on the 12th when it shines at magnitude 5.7 from 2,840 million km. 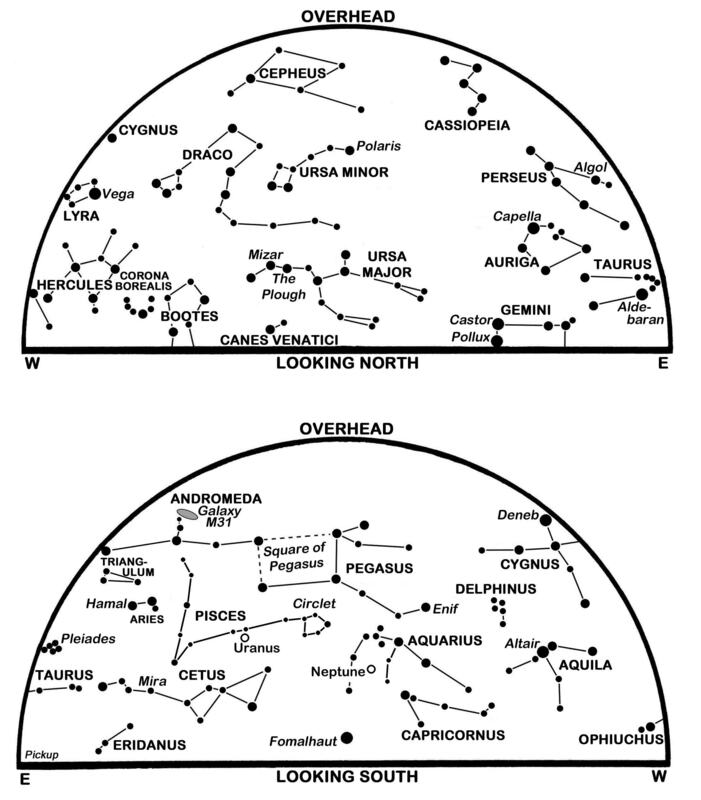 A better chart and binoculars should show it easily, while it is bright enough to be a naked-eye object in a good dark sky. To its south and west, and scudding westwards below the star Iota in Cetus as shown by the arrow on our chart, is the asteroid Vesta. This stood 214 million km away at opposition on September 28 and dims from magnitude 6.2 to 6.8 during October. A more challenging binocular target is the farthest planet, Neptune, which is magnitude 7.8 and stands 4,377 million km away in Aquarius at mid-month. The Sun sinks 11° southwards during October as sunrise/sunset times for Edinburgh change from 07:15/18:49 BST (06:15/17:49 GMT) on the 1st to 07:16/16:35 GMT on the 31st after our clocks reset to GMT on the 25th. The Moon is at last quarter on the 4th, new on the 13th, at first quarter on the 20th and full on the 27th. 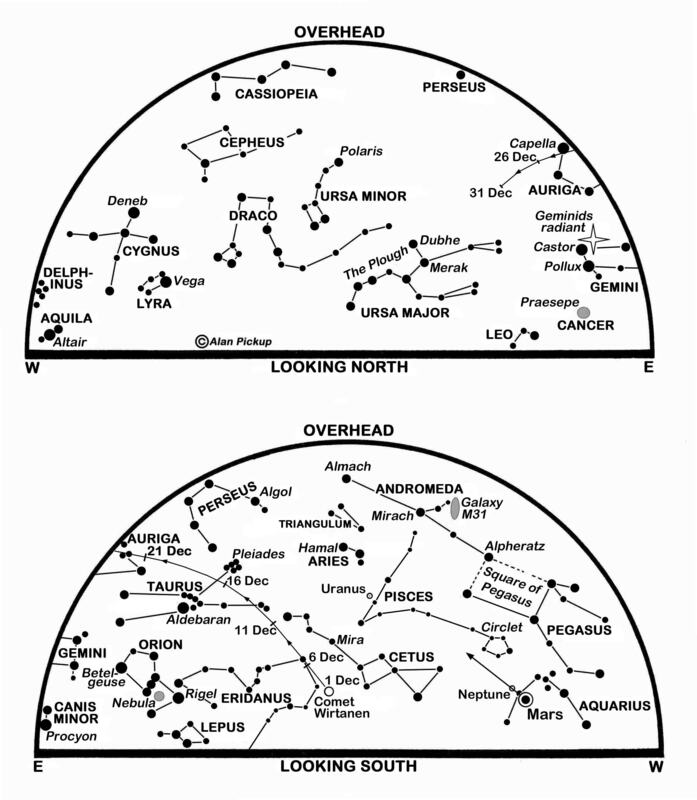 The evening of the 29th sees the waning gibbous Moon occult Aldebaran in Taurus. As seen from Edinburgh, the star winks out at the Moon’s bright limb at 21:57 GMT and reappears at its dark edge at 22:49 – use a telescope. There is no prize for spotting the brightest planet Venus before dawn, though perhaps we deserve one for observing at such unsocial hours. Venus rises to the north of east as seen from Edinburgh at 03:09 BST on the 1st and 02:36 GMT on the 31st, climbing 33° into the south-east by sunrise. Fading a little from magnitude -4.5 to -4.3, it recedes from 76 million to 110 million km and its dazzling disk shrinks telescopically from 33 to 23 arcseconds in diameter as its phase evolves from 35% to 54% sunlit. Venus lies above and to the right of Leo’s leading star Regulus at present but slides eastwards to pass 2.6° south of the star on the 9th as it draws closer to the second outstanding morning planet, Jupiter. The latter is barely a tenth as bright as Venus, but remains brighter than the brightest star as it improves from magnitude -1.7 to -1.8 and slips 6° eastwards in southern Leo. Jupiter’s cloud-banded disk appears 32 arcseconds wide in mid-October. Catch the waning Moon above and to the right of Venus on the 8th, below Venus on the 9th and below Jupiter on the 10th. Set your alarm early for the morning of the 26th when Venus lies just 1° or two Moon-widths below-right of Jupiter in the year’s most spectacular planetary conjunction. 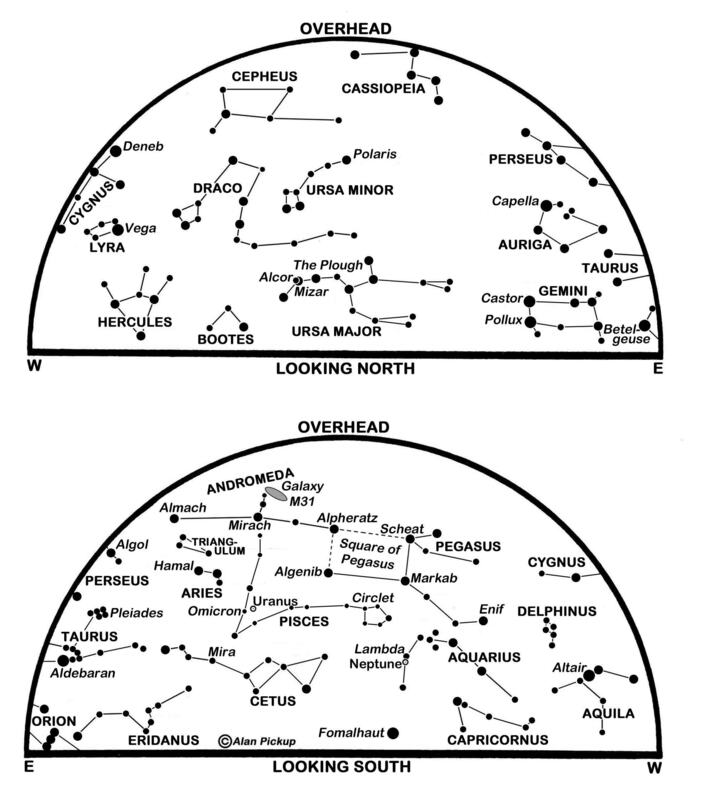 True, the two where even closer together on July 1, but that conjunction occurred with them low in our bright evening twilight while this month’s rendezvous sees than high in the east before dawn. Indeed, it coincides with Venus reaching its furthest angular distance of 46° west of the Sun in the sky. 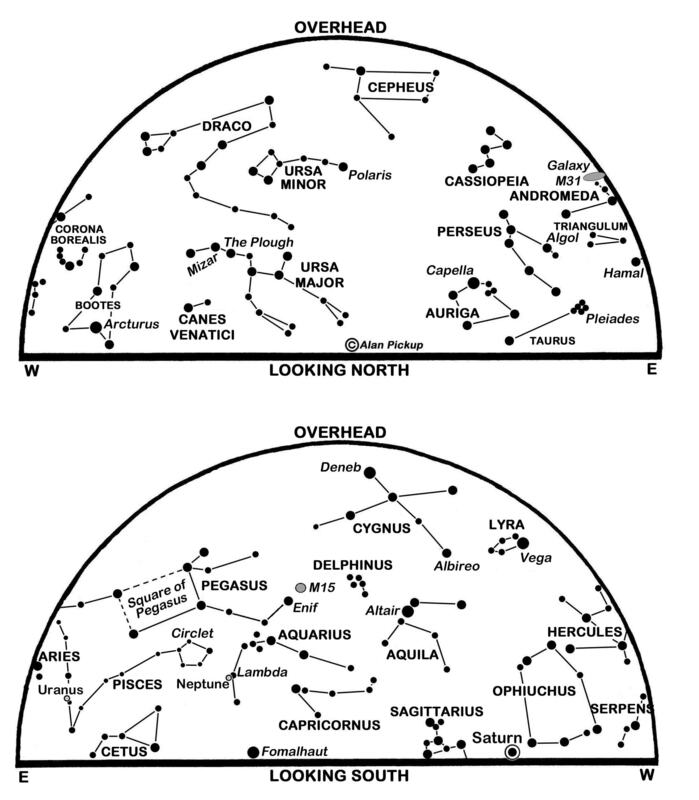 Much fainter is Mars which moves from 4° below-left of Regulus on the 1st to pass only 0.4° north of Jupiter on the 17th. At magnitude 1.8 to 1.7, it is fainter than Regulus while its orange-hued disk is only 4 arcseconds wide. On the morning of the 31st, Mars sits 1.5° to the left of Venus which, by then, lies 4.5° below-left of Jupiter. At the beginning of its best morning apparition of 2015, Mercury emerges from the dawn twilight next week to lie low in the east as our fourth predawn planet. Seen from Edinburgh, it rises 90 or more minutes before the Sun from the 10th to the 26th, brightening during that period from magnitude 0.6 to -0.9 and climbing to be 7° to 10° high forty minutes before sunrise. Glimpse it 2.6° below-left of the very slim earthlit Moon on the 11th. This is a slightly-revised version of Alan’s article published in The Scotsman on October 1st 2015, with thanks to the newspaper for permission to republish here.